I mentioned earlier today, in the news about Final Fantasy VI coming to Steam, that Guilty Gear Xrd Sign is also on the way—and due sooner than FFVI, too. It was interesting in the context of the moment because it doubled the number of games on yesterday's SteamDB leak list that have gone from rumored to confirmed, which of course means that a Half-Life 3 announcement is imminent. But as it turns out, developer Arc System Works has a lot more in store. Guilty Gear Xrd Sign will be joined on Steam by four other Arc System Works releases, beginning with River City Super Sports Challenge All Stars Special, an action/sports game that's set to come out later this month. After that we'll get BlazBlue Chrono Phantasma Extend in February 2016, followed by Melty Blood Actress Again Current Code in the spring, and Under Night In-Birth Exe:Late in the summer. 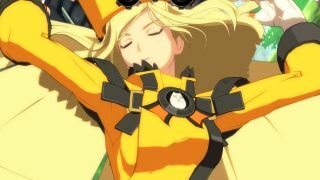 Details on the latter four games are thin, but Arc System Works says Guilty Gear Xrd Sign will feature multiple game modes including a tutorial, as well as ranked and unranked online fights. 12 "familiar" characters and five new ones will come with the game, three of whom—Sin, Elphelt, and Leo—can be unlocked with in-game currency or purchased as DLC. And since we're all just standing around, how about some system requirements? There's no "recommended" spec list, but given that the above is all fairly baseline (except for the CPU, which isn't super-high-end but still kind of an outlier compared to the rest of it) I don't imagine most of you will have any problems running it. Guilty Gear Xrd Sign goes live on Steam tomorrow—that's December 9.